This PDF 1.5 document has been generated by Microsoft® Word 2016, and has been sent on pdf-archive.com on 15/07/2017 at 02:19, from IP address 196.52.x.x. The current document download page has been viewed 129 times. exams – LX0-103 and LX0-104. Candidates must pass LX0-103 before taking LX0-104. Visit the CompTIA website (https://certification.comptia.org/certifications/itfundamentals) to find certification test information, including ordering information. the design of capture solutions, while addressing security requirements. How many Questions are on the assessment, and is the assessment timed? timed tests with a total administration time of ninety (90) minutes. Who must take the assessment? segments) and earned at least a 2.0 in each course section. segments) and who will leave school at the end of the current school year. What is the procedure to order assessments? school’s contact information at CompTIA’s website (www.comptia.org/academy). Linux+ has a regular price of $200 vs. an academic price of $157 per exam. Exams are valid for one year from date of purchase and may not be renewed. be found at this website (https://partners.comptia.org/how-to/purchase-vouchers).  A credit card is required for purchase. How is the assessment administered? 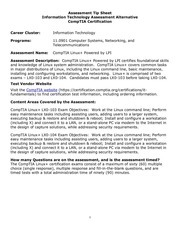 Linux+ exams must be delivered at a Pearson VUE test center (www.vue.com). What is the testing window? The assessment dates are district-determined. contact Diby Kouadio at 517-241-6202 or Joe Polasek at 517-335-3066. The certification tests are available in English, German, Portuguese, and Spanish. 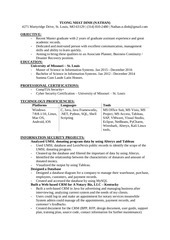 score report by accessing their online candidate profile at Person Vue (www.vue.com). What is a passing score on the assessment? (on a scale of 200 to 800). Who should teachers contact with questions about instruction? reached at 517-373-8545 or KnightT@michigan.gov. This file has been shared by a user of PDF Archive. Document ID: 00624172.